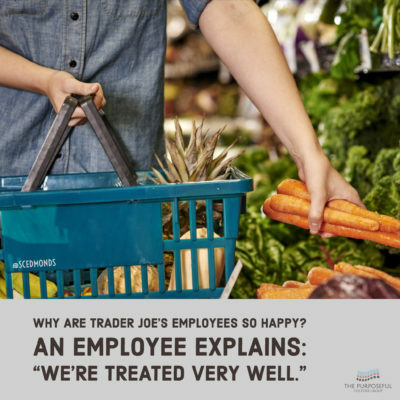 Last month, a Trader Joe’s employee opened a discussion on Reddit, inviting questions about the unique work culture there, why employees are so happy there, and more. None of these characteristics surprise us Trader Joe’s shoppers. We can see employees’ joy and are wow’ed by the service we enjoy and by the store’s terrific products. What is shocking is that so few organizations embrace these characteristics. Despite the knowledge that integrity and respect build great workplaces, too many organizations are lousy places to work in. 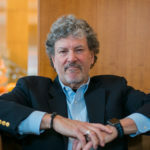 In today’s three-minute episode of my Culture Leadership Charge video series, I share details about how Trader Joe’s leverages those five characteristics to create incredible employee happiness. This is episode sixty-four of my Culture Leadership Charge series. Each episode is a short (two-to-three-minute) video that describes proven culture leadership and servant leadership practices that boost engagement, service, and results across your work teams, departments, regions, companies – and even homes and neighborhoods. You’ll find my Culture Leadership Charge episodes and more on my YouTube and my iTunes channels. If you like what you see, please subscribe! Photo © Adobe Stock – goodmanphoto. All rights reserved. To what degree does your company model these five healthy culture characteristics? Share your insights or questions on Twitter, Facebook, and LinkedIn.